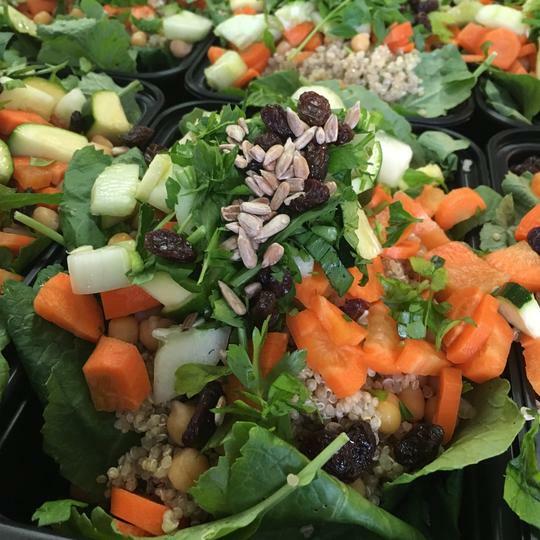 Casbah is inspired by the bright, vivid flavors of Moroccan cuisine, with high-protein quinoa and chickpeas, organic carrots, sunflower seeds, raisins, parsley, and a spice-infused Middle Eastern vinaigrette. With 16 grams of protein, the Casbah GO Box is a great source of high quality protein – kale, chickpeas and quinoa. Adequate amounts of protein in our daily diet are important for growth, body tissue repair, and a healthy immune system. A great source of healthy fat, the Casbah GO Box has good fats like monounsaturated and polyunsaturated, that aid in the absorption of critical vitamins and nutrients. These good fats, like olive oil, play an important role in a healthy diet - they improve blood lipids, control blood pressure, insulate body tissues, transport vitamins through the blood and fight visceral belly fat. Our dressings are farm-made and contain healthy fats so you don’t have to worry about sabotaging your healthy meal with an unhealthy dressing. Vitamin K is an essential nutrient for responding to injuries, regulating blood circulating, transporting calcium through the body, reducing bone loss and the risk of bone fractures. Our Casbah GO Box is chock full of Vitamin K, from kale and parsley. Known as a superfood, kale is the king of leafy greens and loaded with beneficial compounds like Vitamin K. Aside from kale, we use parsley as a garnish in most of our GO Boxes – it adds an extra punch of flavor and is great for you too.